With these ears Monroe can hear two cotton balls rubbing together from 50 yards away. 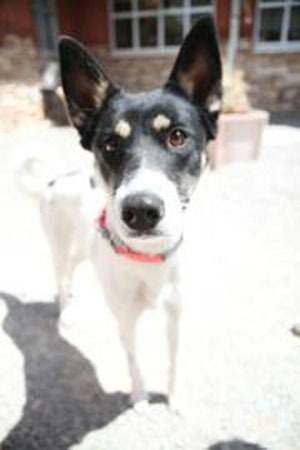 Monroe is an adorable 1-year-old female Border Collie mix with the cutest pricked up ears. She weighs 42 pounds. Monroe is at Lollypop Farm for a second time through no fault of her own. This playful girl has lots to say and tons of energy! She loves to run around and take long walks. Monroe is a social butterfly and a very curious dog. She inspects and sniffs absolutely everything! During down time she is a lap lover. Children over the age of 6 are recommended. Monroe will need to meet everyone in the household, including any resident dogs to make sure they will be buddies. Border Collie’s are very intelligent and Monroe is no exception. She will need a family who will exercise both his mind and body. Monroe can’t wait to meet you! Hannah, the cat from last week is still waiting to be adopted!